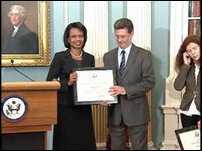 United States Secretary of State, Condoleeza Rice, Wednesday, awarded the 2008 Human Rights and Democracy Achievement Award to Michael De Tar, the chief of the Political Section of our Embassy in Colombo, Sri Lanka, for engaging "constructively with Sri Lanka while underscoring our [U.S.'s] human rights," and for proposing the roadmap adopted by the Sri Lankan Government "to induce a paramilitary aligned with the government to begin to release its child soldiers [in the east]." The situation in the East, however, has rapidly deterioted recently with Human Rights Watch accusing the Colombo-backed paramilitaries in the east for thirty murders and thirty abductions during September and October. "Secretary Rice presented the "Freedom Defenders Award" to Yulia Latynina, an independent journalist, writer and radio host from Russia, and the "Diplomacy for Freedom Award" to James D. McGee, U.S.'s Ambassador to Zimbabwe during the same ceremony held at the Treaty Room Washington, DC. Rice said that De Tar was "a key actor in the international effort to monitor an official Commission of Inquiry investigating high-profile cases of human rights abuse, and he has responded quickly and effectively when journalists and other activists have been threatened or arrested." The Independent Group of Eminent Persons (IIGEP), a rights monitoring mission set up to oversee the investigations of rights violations by the local Commission of Inquiry (CoI) terminated its observation mission reasoning that the proceedings of the CoI have not been transparent and did not satisfy basic international norms and standards. The IIGEP blamed the Government of Sri Lanka for "absence of will" in the present Inquiry to "investigate cases with vigour, where the conduct of its own forces has been called into question." "Our diplomatic effort to advance human rights is not just a job for ambassadors, and that is why annually we confer the Human Rights and Democracy Achievement Award upon an outstanding officer serving at one of our posts abroad. This year’s recipient is Michael DeTar, the chief of the Political Section of our Embassy in Colombo, Sri Lanka. Sri Lanka’s 25-year conflict has escalated over the last two years, triggering a sharp increase in human rights violations by the warring parties – the government, the Liberation Tigers of Tamil [Eelam], and paramilitary organizations. Michael found creative and pragmatic ways to engage constructively with Sri Lanka while underscoring our human rights concerns. Michael helped position the United States to play a leading role in the stabilization and recovery of the conflict-torn Eastern Province, focusing on disarming and demobilizing paramilitaries there. He was also a key actor in the international effort to monitor an official Commission of Inquiry investigating high-profile cases of human rights abuse, and he has responded quickly and effectively when journalists and other activists have been threatened or arrested. The Sri Lankan Government adopted Michael’s proposed road map to induce a paramilitary aligned with the government to begin to release its child soldiers. So using his extensive network of civil society and media leaders, Michael has enriched our reporting on human rights conditions in Sri Lanka. And he has not only reported, he has acted. And so I am delighted to bestow the 2008 Human Rights and Democracy Achievement Award on Michael De Tar," Rice said. Meanwhile, in an op-ed column in the Washington Post, former U.S. President Jimmy Carter said: "With a new administration and a new vision coming to the White House, we have the opportunity to move boldly to restore the moral authority behind the worldwide human rights movement.The moral footprint of the United States has always been vast. "Our next president has an unprecedented opportunity to lead through example by inspiring and supporting those who would reach for freedom and by being tough and effective with those who would impede freedom's march. All Americans must give him full support." 14.04.08 IIGEP: Colombo lacks political will to investigate Human Rig..